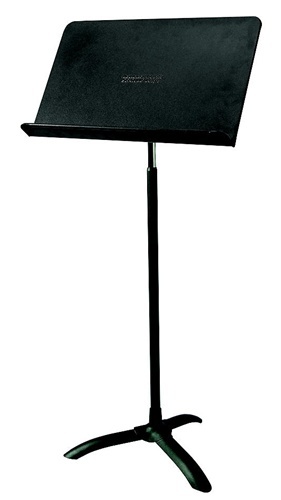 This durable stand is made from 22 gauge steel and has rolled-steel edges to protect instruments and preserve the stand. It is coated with a black textured finish that resists scratches and chipping. The stand vertically adjusts to a range from 24" to 46" (lip to floor), using our spring loaded adjustable tube. Reading surface desk features simple tension tilt that provides smooth adjustment and strong tension at any position. Dimensions are 20 1/2" W x 12 1/2" D.